Trump's Plan To Zap Incoming Missiles With Lasers Is Back To The Future The president's 2020 budget plan calls for studying space-based energy weapons as a way to stop warheads. Critics say it didn't work with the "Star Wars" program in the 1980s and it won't work now. President Trump vowed in January to "detect and destroy any missile launched against the United States anywhere, anytime, anyplace." Doing so would likely mean basing defenses in space. 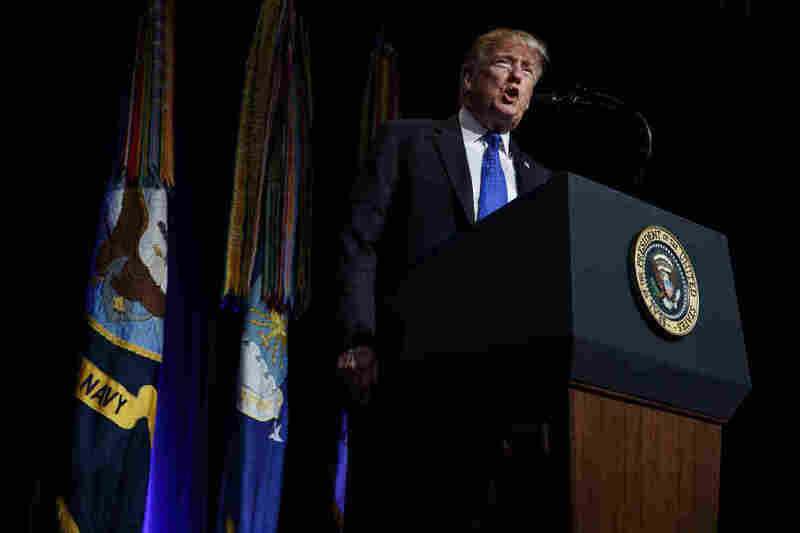 The defenses outlined by Trump look almost exactly like a decade-old program known as the Strategic Defense Initiative. That plan was laid out by President Ronald Reagan in a 1983 speech. 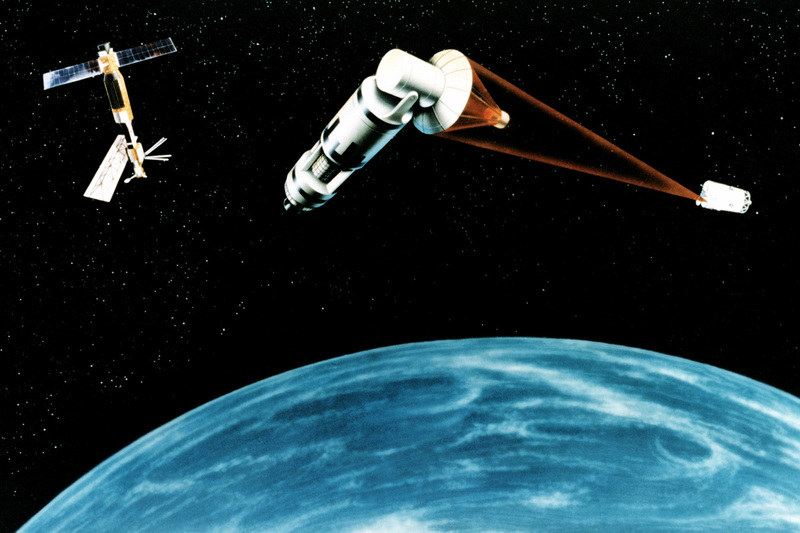 Reagan's program, dubbed "Star Wars," imagined an impenetrable shield that would include orbiting lasers and particle beams to zap then-Soviet missiles before they could hit their targets. "It's remarkable how similar all this stuff is. I'm actually not sure it's surprising," says James Acton, co-director of the Nuclear Policy Program at the Carnegie Endowment for International Peace. Acton says missile shields are limited by the rules of physics. "At the end of the day, missile defense is a very, very tough problem, and there are a very limited number of ways of solving that problem." It's virtually impossible to make a nationwide missile shield without building it in space — it's only by taking the ultimate high-ground that one can defend a target as big as the U.S. Unfortunately, trying to operate in space introduces a lot of problems. Technology that's already tough to operate on the ground must endure blistering heat, freezing cold, and cosmic radiation. And if anything goes wrong, it can't be fixed. 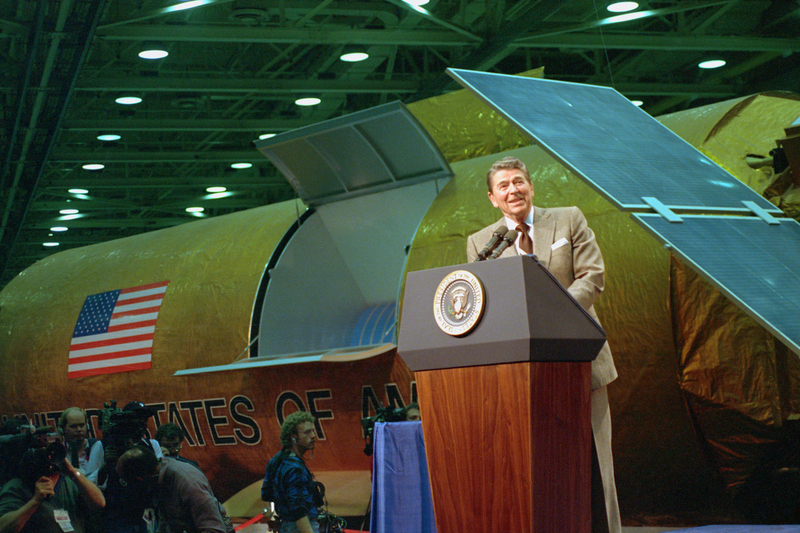 Despite tens of billions, Reagan's Star Wars program never produced a shield. But some say it's worth reconsidering. President Ronald Reagan's Strategic Defense Initiative, also known as "Star Wars," was a cornerstone of his defense policy. Things have changed since the 1980s: Lasers are much smaller and much more powerful; satellites that once had to be the size of a school bus can be shrunk to the size of a shoe box. "And we can get launch costs down, which was one of the biggest cost-drivers," Heinrichs says. Little satellites combined with new and cheap commercial rockets might make a space-based defense program more affordable, she notes. The Trump administration appears intent on revisiting some of the Star-Wars-era technology. The president's 2020 budget plan calls for $116 million to develop directed energy weapons for missile defense and $34 million more for particle beams. It also calls for $132 million for advanced sensors, which are essential to any space-based defense. It remains to be seen whether Democrats in the House will go along with the funding proposal. Critics say a new Star Wars program is unlikely to come to much. Laura Grego, a physicist with the Union of Concerned Scientists, concedes there's been progress but says there hasn't been enough of it. Take particle beams — focused streams of atoms designed to fry a target. Here on Earth, the equipment needed to generate a powerful beam can be miles long and use as much electricity as a small city. Nobody's found a way to shrink that technology to satellite-size. In 1989, a prototype was launched briefly into space on a suborbital flight. It weighed 2,500 pounds and produced a minuscule beam that lasted only a few minutes. It's remarkable how similar all this stuff is. I'm actually not sure it's surprising. "I don't know why they think this is practical again," Grego says. And there's another problem no amount of technology can solve: A space-based system is constantly spinning around the Earth in its orbit. Reagan's Star Wars program envisioned space-based lasers hitting targets high above Earth. The lasers never made it off the drawing board. "A single weapon is never where it's supposed to be for it to work well, so you'd need a constellation of them," Grego says. "It becomes really expensive really quickly." A 2012 study by the U.S. National Academy of Sciences said a space-based defense system would require many hundreds of satellites and might cost as much as $300 billion dollars. That figure, too, is disputed by some who think space-based defenses deserve a second look. Thomas Karako, director of the Missile Defense Project at the Center for Strategic and International Studies, says it is based on the only technology that could be ready in the foreseeable future: space based interceptor missiles. Lasers would have longer ranges and require fewer satellites, he points out. "If we can get this right from space, I think we should be thinking about it," Karako says. But for Grego, the renewed focus on technology overlooks the actual way Reagan ended up reducing the nuclear danger — not through lasers and beams, but through a series of arms control treaties that limited the numbers and types of nuclear weapons the U.S. and the Soviet Union could possess. "It wasn't because we got great at missile defense," she says. "It was just the hard work of treaties and negotiations."